According to RatingDapp and RatingToken's Ecology Monitoring Platform, there are 63,962 daily active users with 11,086,158.1EOS transactions on EOS in January 2019. Average 88,411 daily active users with 5,972,534.82EOS transaction in February. Average105,608 active users with 4,283,089EOS transaction in March. 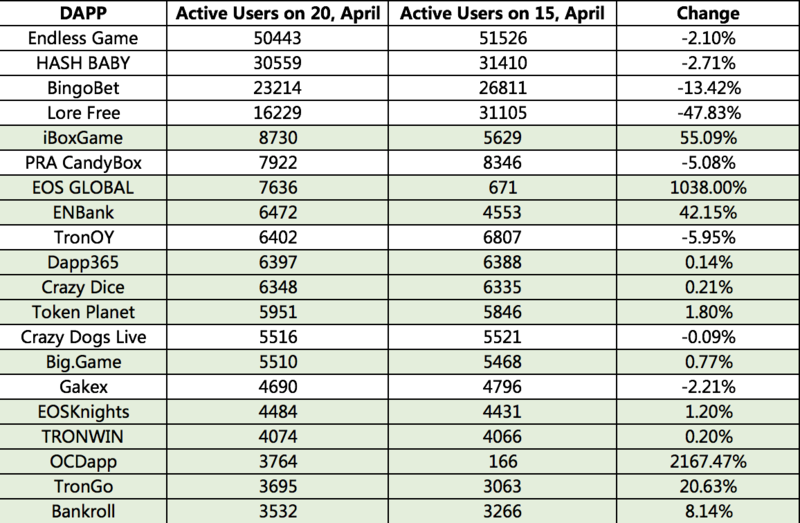 Average 143,865 daily active users in April, which increased 124.92% compared with January. Daily average transaction is 3814.27.77 EOS, which decreased 65.59% compared with January. According to RatingDapp and RatingToken's Ecology Monitoring Platform, there are 26,612,223 transactions on EOS which decreased 5.4% compared with last week, 471,238 transactions on ETH which increased 4.53%，6,921,684 transactions on TRON which decreased 15.56%; While Casino Dapp transactions accounted for 59.53% on EOS, 24.29% on ETH, and 85.58% on TRON respectively. According to RatingDapp and RatingToken's Ecology Monitoring Platform, there are 3,804,765 transactions on EOS, 992,811 transactions on TRON, 401,832 transactions on IOST, 62,576 transactions on ETH. The POWH3D and FOMO3D development team selected TRON platform to release new DApp games, and released some DApp images that will be launched recently. According to RatingDapp and RatingToken's Ecology Monitoring Platform, there are 129 DApps released on TRON since March, of which 71% DApps' active time exceeds more than 100 hours. 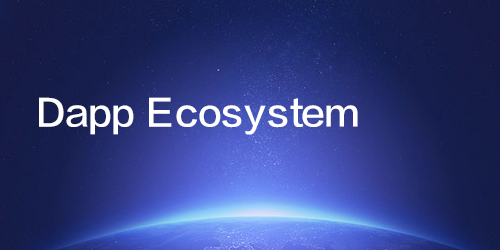 According to RatingToken and RatingDapp's Ecology Monitoring Platform, there are totally 55 DApps released on Ethereum since March, 2019. 70% newly releasing DApps' active time is less than 99 hours, 25% DApps are even less than 10 hours. 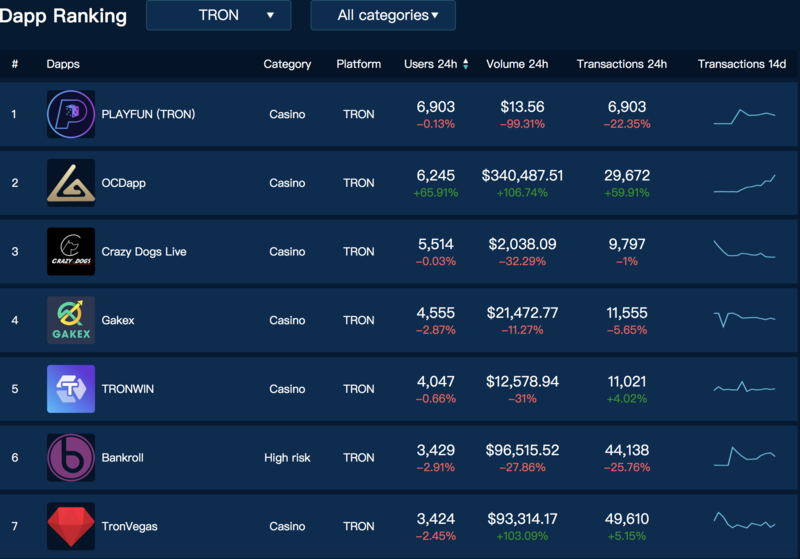 RatingToken and RatingDapp's Ecology Monitoring Platform tracked 10 projects on Twitter’s Activity Index, TRON still leads the way with twitter active index of 260.4 in the past 30 days. At the same time Twitter activity index of ONT is very close to TRON, which is 251.71. 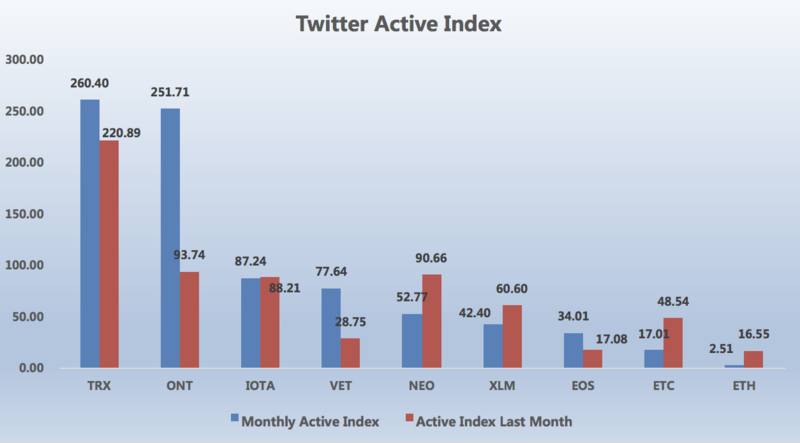 Twitter active index of ONT increased 168% compared with last month. There are 299 Dapps with active users on EOS, 394 Dapps on ETH, 239 Dapps on TRON. On the contrary, there are 153 Dapps without active users on EOS, 145 Dapps on ETH, 37 Dapps on TRON. 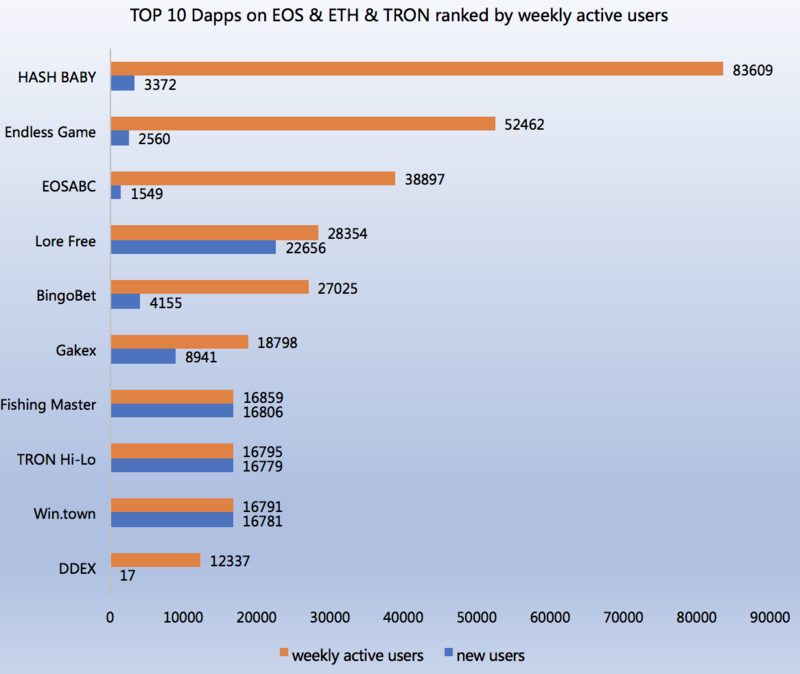 There are 2176 Dapps is totally tracked by RatingDapp & RatingToken’s Dapp ecology monitoring platform on ETH, EOS and TRON, of which only 43 Dapps new users exceed 1000 users in April. 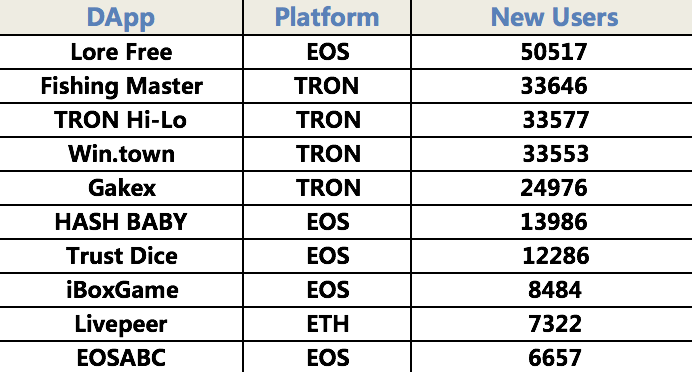 According to RatingToken and RatingDapp's ecology monitoring data, Top 5 public-chain platforms ranked by market cap are ETH, EOS, IOTA, TRON and NEO. Ethereum is the TOP 1 platform on Github code submissions and contributors in the past week. Total transactions of dapps on EOS is about 50 times that of ETH in the past month. According to RatingDapp & RatingToken's DAPP ecology monitoring data about ETH, EOS and TRON. There are 447 dapps that has transaction history on EOS with 110,362,165 transactions, 517 dapps on ETH with 2,202,508 transactions, and 254 dapps on TRON with 45,830,385 transactions. According to the data from RatingToken & RatingDapp. 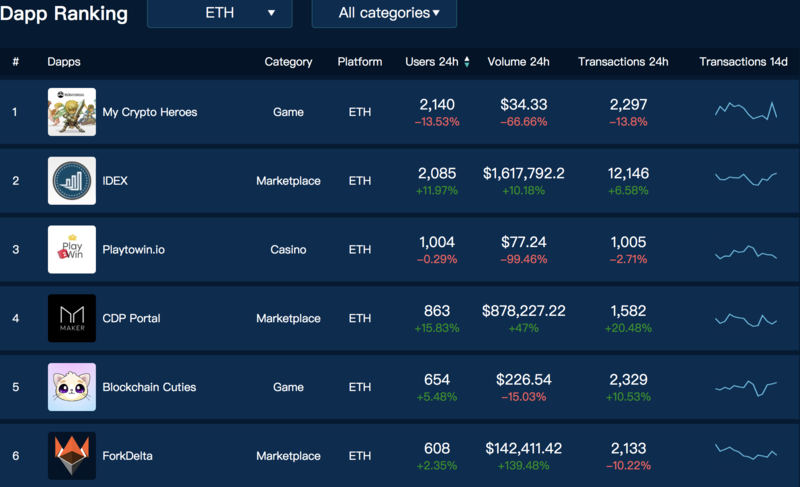 EOS ranked no.1 on the quantity of dapps with more than 20000 transactions. 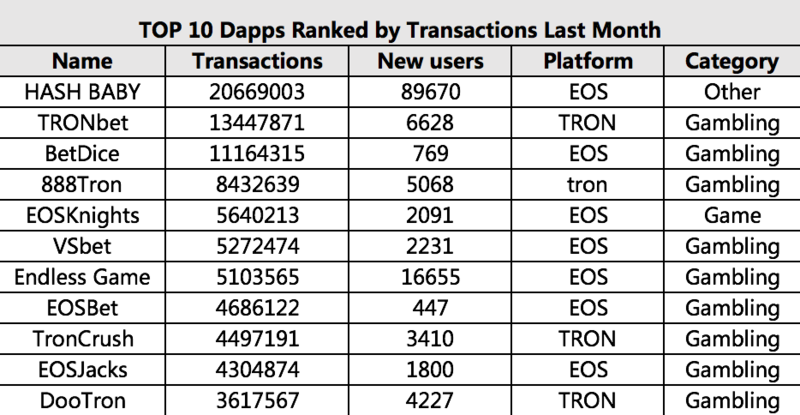 There are 7 dapps on ETH and 95 dapps on EOS, 68 dapps on TRON with over 20000 transactions in Q1 2019. Insights| Easy Arbitrage Profits in Bear Market? NovaChain's Annualized Rate of Return is as High as 3,778%? According to RatingToken, a big data rating agency, arbitrage bot platforms are very active recently. These platforms claim to have developed "powerful" arbitrage bots that exploit different prices of the same cryptocurrency on different exchanges to achieve stable profits. According to RatingToken, a third-party data rating agency, bearish market sentiments, coupled with the sluggish pickup of ETH and the lack of investment opportunities, led to a wave of Fomo3D and POWH3D copycats, albeit a short-lived emergence for most. 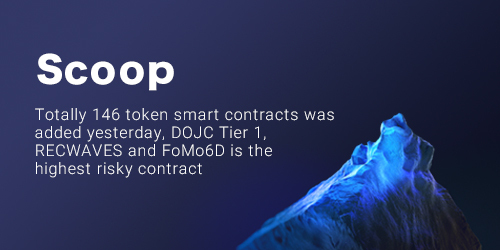 Data | Totally 239 token smart contracts was added yesterday, FreeCoin, sentacoin and FomoDD is the highest risky contract. 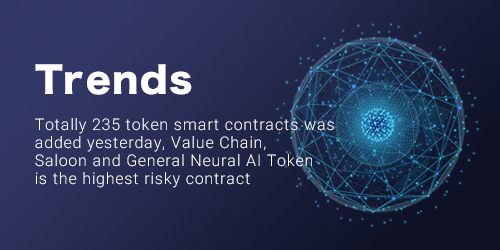 According to the independent third-party data analysis organization RatingToken, a total of 2078 contract addresses were added worldwide, of which 239 were token smart contracts on August 29, 2018. 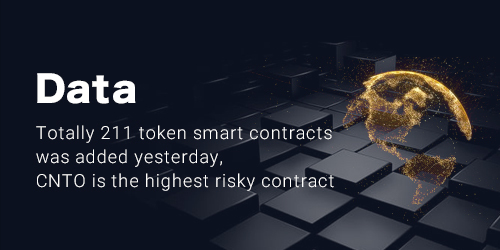 According to the independent third-party data analysis organization RatingToken, a total of 1677 contract addresses were added worldwide, of which 211 were token smart contracts on September 05, 2018. 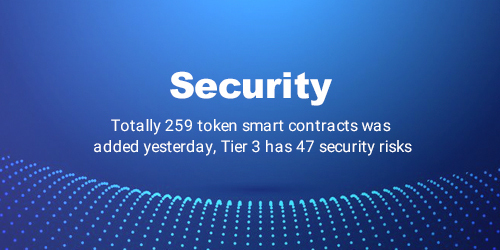 According to the independent third-party data analysis organization RatingToken, a total of 1936 contract addresses were added worldwide, of which 259 were token smart contracts on August 28, 2018.